ACQUA DI PARMA Blu Mediterraneo Arancia Di Capri Relaxing Shower Gel 200ml, a hydrating shower gel that leaves a pleasing sensation of smoothness and promotes skin elasticity. The soft texture gently cleanses the skin, enveloping it in the relaxing notes of ACQUA DI PARMA. Formulated with natural Pentavitin to boost the hydrating action of Vitamin E. Capri, an island, a symbol of the Italian Mediterranean. Luminous. Sunny. Relaxing. Arancia di Capri captures its essence by combining the fresh, crisp top notes of Sicilian Orange, Mandarin and Lemon. At the heart, the Petitgrain essence blends with the intense aroma of Cardamom. At the base, a soft touch of Caramel and the sensual notes of Musk. ACQUA DI PARMA Blu Mediterraneo ARANCIA di CAPRI Relaxing Shower Gel 200ml was found on 4 websites and was price compared using EAN: 8028713571107. 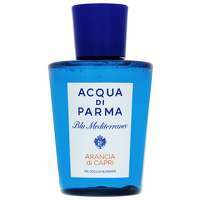 The cheapest ACQUA DI PARMA Blu Mediterraneo ARANCIA di CAPRI Relaxing Shower Gel 200ml is shown as the main item, prices range from £28.00 to £35.00, excluding delivery. Price comparison based on price and delivery charges, with any valid discount codes being applied, is shown in the table above. Prices and information correct at the time of publication.